Fetal bovine serum, or FBS, is an important component of many types of cell culture media, and some researchers require heat inactivated FBS. But for researchers interested in isolating exosomes from cultured cells, standard heat inactivated FBS can introduce unwanted complications—bovine exosomes, which can cause significant background issues or interfere with functional studies. Which is why SBI developed heat inactivated Exo-FBS, our patented exosome-depleted FBS. Exo-FBS has greatly reduced levels of bovine exosomes (Figures 1 and 2), bovine miRNAs (Figure 3), and is even cleaner than ultracentrifuged FBS (Figure 4). Cell growth in media supplemented with Exo-FBS is similar to cell growth in media supplemented with standard FBS (Figure 5). Figure 1. 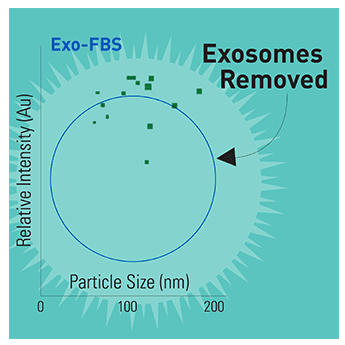 NanoSight particle analysis shows low levels of exosomes in Exo-FBS. While standard FBS contains exosome-sized particles (top panels), Exo-FBS shows almost no particles (bottom panels). Standard FBS and Exo-FBS samples were diluted 1:1000 and then analyzed for particle size and abundance using a NanoSight LM10 instrument. Figure 2. Bovine α-CD63 ELISA shows low levels of exosomes in Exo-FBS CD63 is an exosome-specific marker. An α-CD63 ELISA of standard FBS and Exo-FBS shows very low levels of CD63 in Exo-FBS, supporting the NanoSight particle analysis which showed low numbers of exosome-sized particles in Exo-FBS (Figure 1). Equal volumes (50 µl) of either standard FBS or Exo-FBS depleted media supplement were used and the graphed results normalized to the signal level of standard FBS. Figure 3. qPCR assays show undetectable levels of bovine exosomal miRNAs in Exo-FBS. While standard FBS contains amplifiable miRNAs (12 of the 72 individual miRNAs tested, left panels), Exo-FBS shows no amplifiable miRNAs (right panels). Standard FBS and Exo-FBS media supplements (4 ml) were treated with Trizol extraction methods to recover exosomal RNAs. RNA was converted to cDNA and 72 individual bovine microRNAs were measured by qPCR using SBI’s QuantiMir system. Figure 4. NanoSight analysis shows Exo-FBS is cleaner than ultracentrifuged FBS. Quality Control data is generated on every batch of Exo-FBS produced at SBI by comparing NanoSight particle count analyses to the source FBS, FBS ultracentrifuged for 18 hours, and Exo-FBS. All samples were diluted 1:100 and data collected in triplicate. Figure 5. Cells grown in 10% Exo-FBS show comparable growth rates to 10% standard FBS. HT1080 fibrosarcoma cells, PC-3 prostate cancer cells, MCF-7 breast cancer cells, and HEK293 cells were seeded at either 10,000 or 20,000 cells and then cultured under standard conditions at 37°C with 5% CO2 for 5 days.